Its that time of year once again! Arduino Day 2017!! On April 1st (no joke! 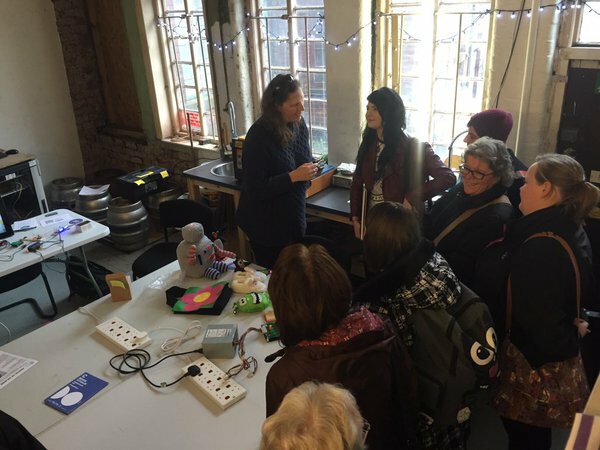 ), for the third year running, we will be hosting an Arduino Day event at the hackspace. 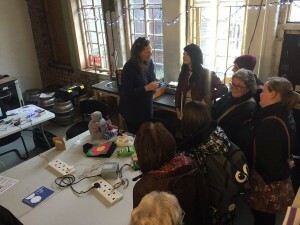 The event itself will begin at 10am and will include several talks from current members on Arduino basics, a show and tell of projects that have been made using Arduino and, of course, the workshop will be open for anyone to try their hand at building something, with lots of members on hand to help out. 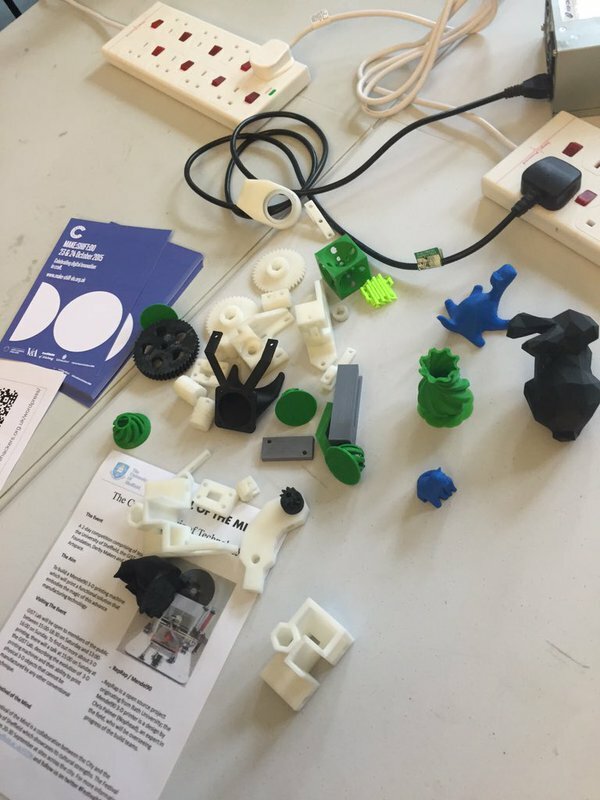 For non-members the event will be free to attend so if you think you know anyone that would be interested in learning about this invaluable digital making tool, or would just like to learn something new please share this post with them. We won Sheffield Soup Funding for our expansion! Earlier this week I (Bugs) went along to talk at Sheffield Soup, a local crowdfunding event. 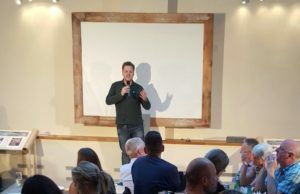 A sell-out crowd of 150 Sheffield locals, plus representatives of local media, got together to hear four people pitch their ideas for a project to benefit the city. After each group gave a four minute talk and answered four questions for the crowd, there was time to eat, drink, listen to some great live music, and wander around chatting before the final vote. 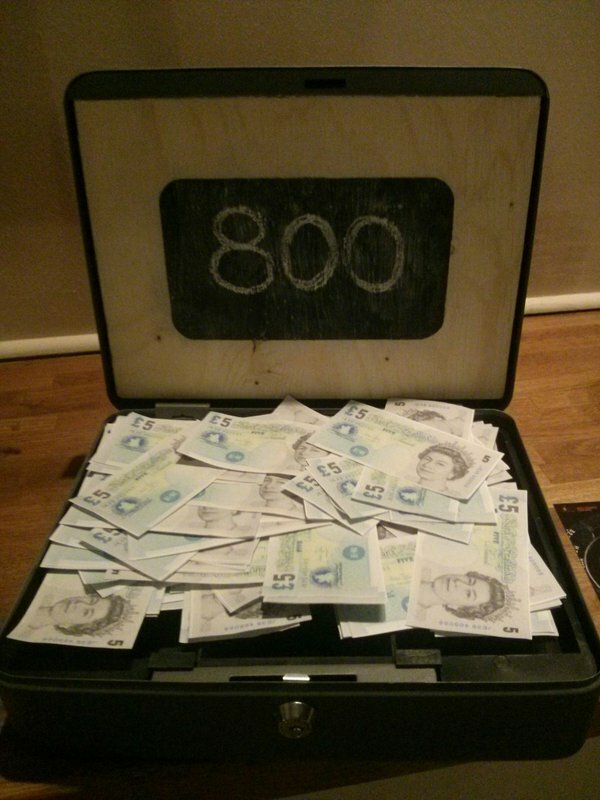 In the end, the audience voted to give us the £800 prize money, to fund our upcoming Hackspace expansion project! Expanding into the cellar beneath our current space with roughly double the amount of room we have to work in, and give us a dediated “dirty workshop” for stuff like woodworking, metalwork, glasswork, screen printing… anything our members want to try that needs a lot of space and makes a mess! 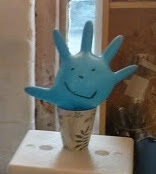 Just as well: our weekly sessions are starting to feel decidedly crowded, which is a great problem to have and a sign that the hackspace project is going well. 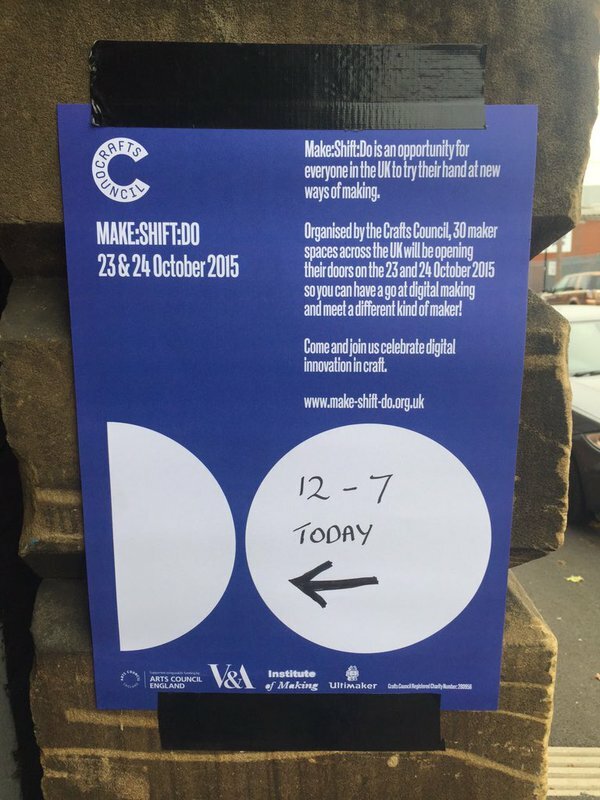 On Friday October 23rd we took part in MAKE:SHIFT:DO. 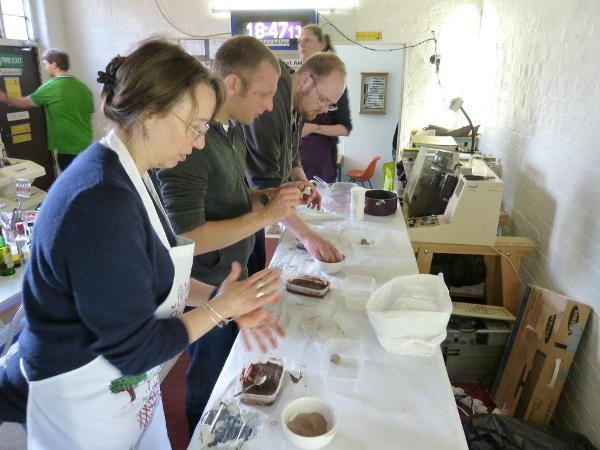 A creative open day run by the Craft Council. 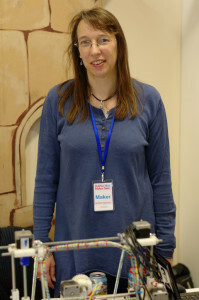 Also taking part at Portland Works was James Wallbank who was doing Laser Cutting tutorials. We displayed a number of our ongoing projects and had a few interested parties. Photos below. Portland Works was the only location in Sheffield to be taking part in MAKE:SHIFT:DO this year and 1 of only 4 locations in Yorkshire as a whole. We hope to run a similar (if not much, much better) event next year. A Tweet mentioning us from the Craft Council. 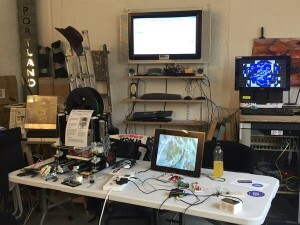 A number of projects running including a 3D printer and pirc running in the background. A handful of our visitors. A poster advertising the day. 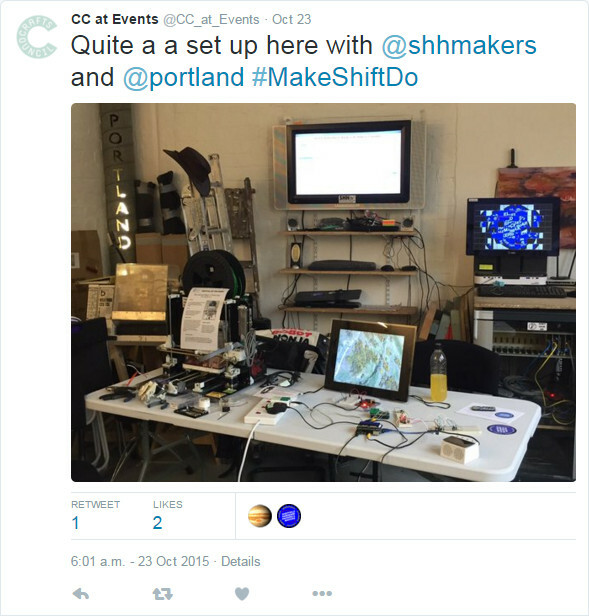 Aaron (of Oomlout fame), interviewed SHH&M member and trustee Janine about our hackspace and what we do here. It’s a nice writeup, with Janine giving a great introduction to our group and a few of the projects that we took along to the Halifax Mini Maker Faire. You can read the interview, and see some nice photos of the projects we took to Halifax, here. As ever: if you’re interested in what we do, get in touch, or look at the calendar and just turn up to a meeting to meet us. 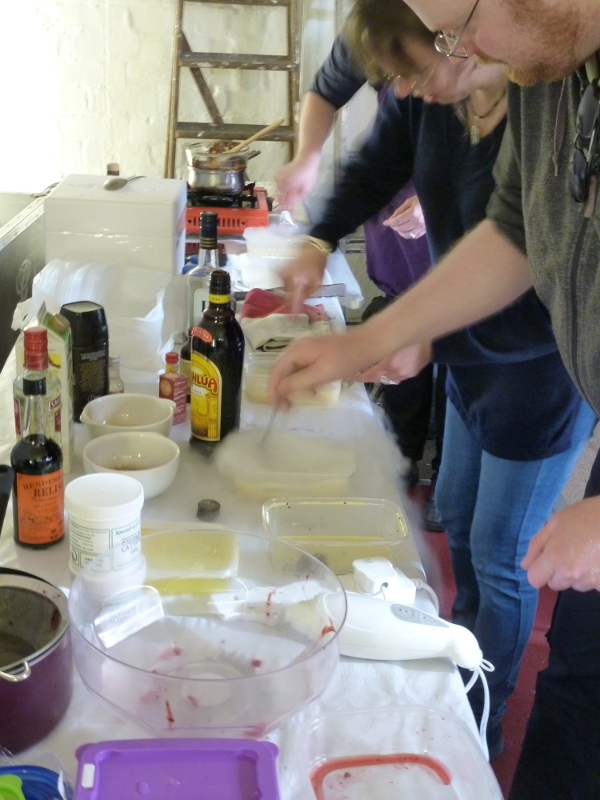 This Saturday we made dry ice icecreams and sorbets, had a chocolate truffle making masterclass, and experimented with molecular gastronomy to make burst-in-the-mouth fruit puree spheres. Plus a BBQ and our normal hacking session alongside. An exhausting, brilliant day! 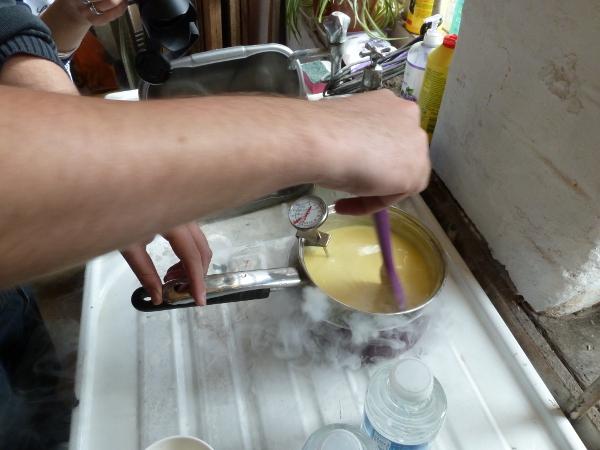 …then everyone started adding their own mix of flavours, before quickly beating in dry ice converted to a powder in a finely calibrated process of Janine frenetically bashing it with a hammer. Verdict: Amazing icecream! My personal favourite was the Glenlivet whisky icecream, but they were all (vanilla, cherry and chocolate, chocolate mint, Rum, Kahlúa) fantastic. Andy’s Kiwi, Apple and Lime sorbet was similarly great. The fizzy taste from the dry ice gave it a really delicious edge. 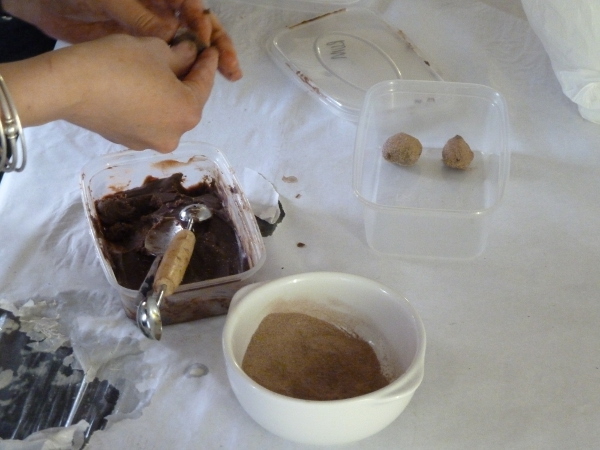 Sarah ran our truffle making masterclass — deliciously messy, with fantastic results! Another great mix of flavours tried out — my personal favourite was chocolate and Henderson’s Relish. Because I’m pretty sure it’s illegal to cook anything in this city without at least a splash of Hendo’s. 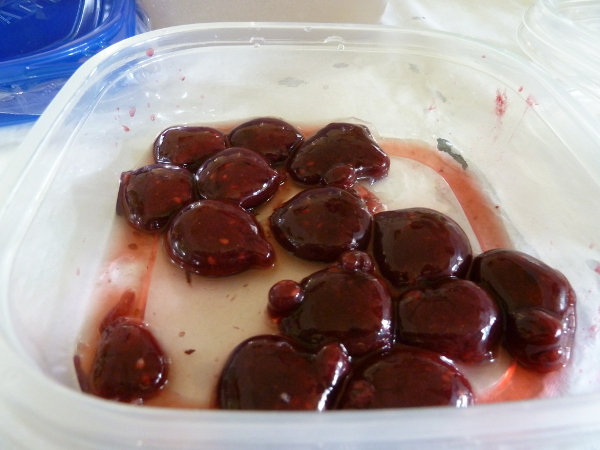 Never mind that they look like monkey kidneys, they were delicious, a really fun texture, and surprisingly simple and enjoyable to make. Lots of finesse needed for perfect spheres, but definitely worth trying yourself! Finally, our incipient tradition of a BBQ and a few beers in the sunny courtyard before cleaning up and heading home to our respective food comas. Thanks to everyone for helping out! If you missed it (maybe you haven’t come along to a meet yet? ), you should’ve been there! …but our lips are sealed. 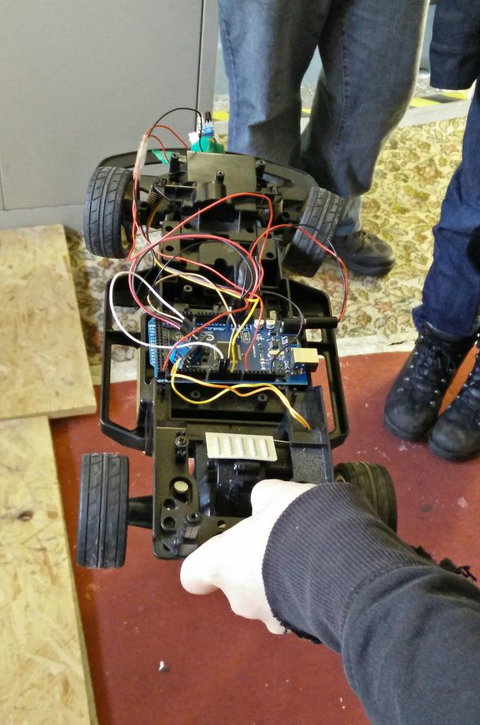 Arduino Day 2015 was great fun! Our meetup (and first public event in the new space!) for Arduino Day 2015 went brilliantly, thanks to all who came. Lots of new faces and old friends called in through the day, for a series of talks about getting started with Arduino, and to check out each others’ projects. A good time — and some really great discussions — were had. A post from the archives this week. We have a couple of members who’re interested in kites and kite photography, so we decided to try making some of our own. 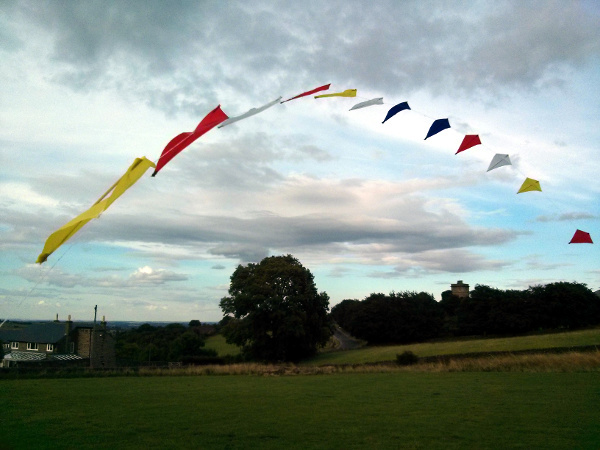 For a first project, a kite arch! 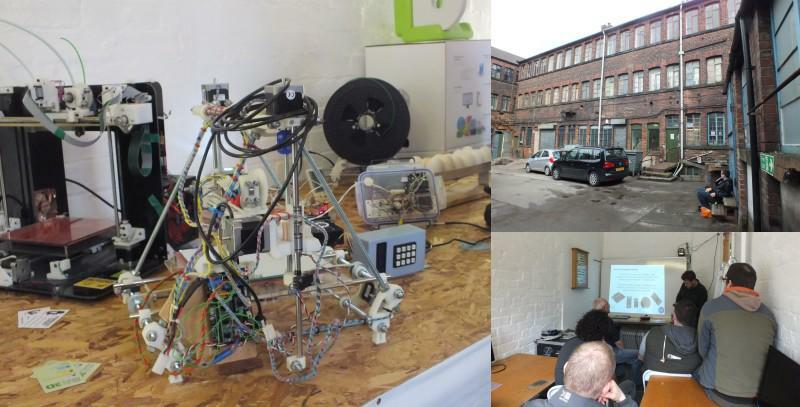 Last week as part of our research in to opening our own hackspace, one of our members contacted Space. Nottingham was one of the first hack spaces to pop up in the UK, it followed on from London. Arrangements were then made to go and visit. This was to gather as much information as possible related to running/setting up a Hack Space. They have a free open night every Wednesday open to the public. Above is the Lounge area. This is the first room you enter in the space. This is where members sit down, have a chat and chill. The room has a fully kitted media system with a projector and sound equipment, plus mood lighting. They have all of the kit to host presentations/talks. Or you can kick back and watch a film. Around the room there were interesting as well as unique items that had been collected over the years. The collection included old test gear, audio recording equipment and much more. The main making area is where most of the activity takes place. In this room is a collection of kit for members to use. This includes sewing and craft kit and 3D Printers. 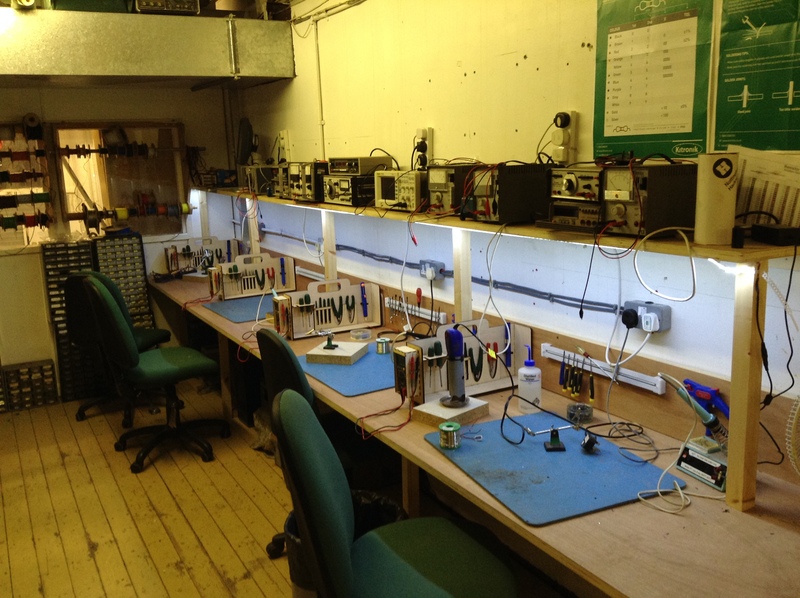 Below is a list of some of the tools that Nottingham’s Hackspace has on offer to it’s members. – The all important Laser Cutter! The overall assortment of tools was astonishing. 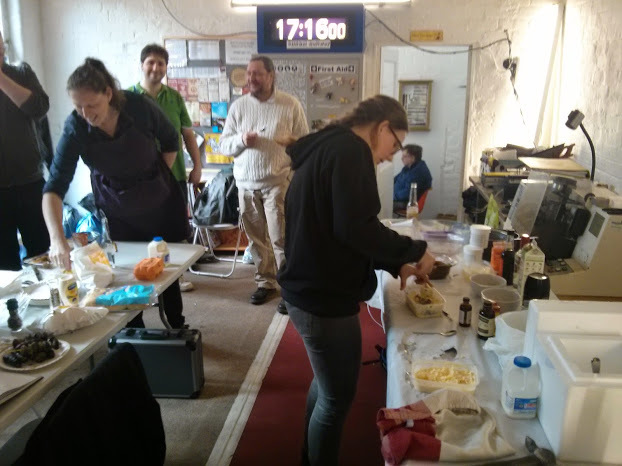 Nottingham’s hackspace now has around 350 members and counting. Their laser cutter was purchased from , who import laser cutters then modify and improve them before selling them on. 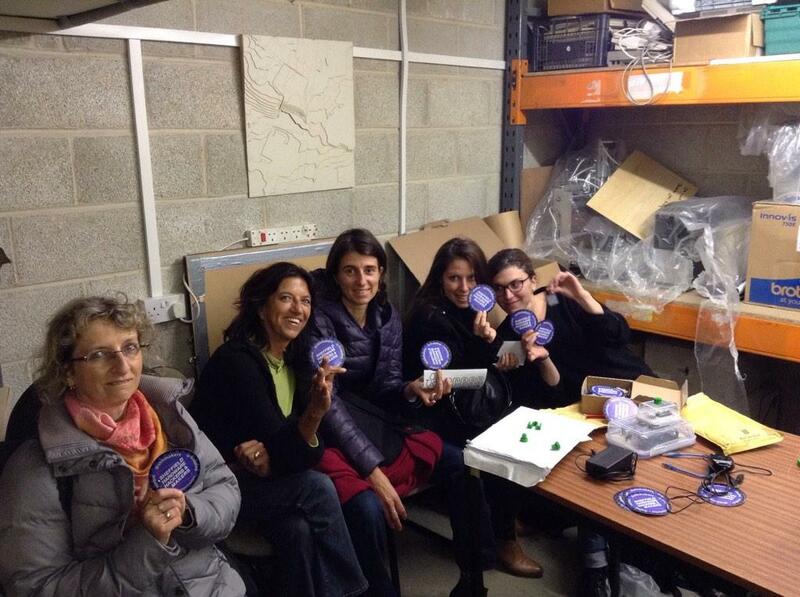 The laser cutter runs from an RFID system linked in to the power cable, so members pay per hour of use. It is a really good idea especially seeing how you can keep track on who is using the machine. Overall it was a very successful event. All of our questions where answered, giving us a lot more information than we started with. We would like to thank everyone there who showed us around and made us feel welcome. 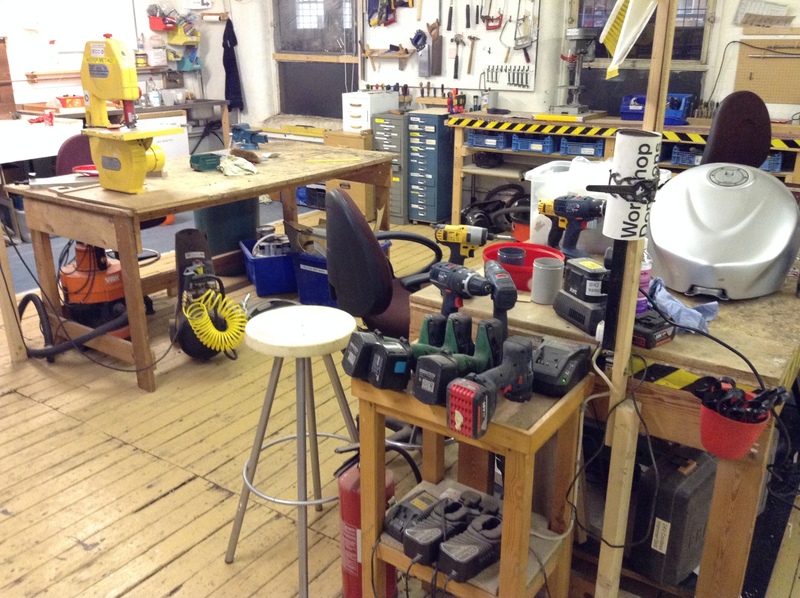 You can visit Nottingham’s Hackspace website here: or you can follow them on Twitter . Just to round off the evening Nottingham Hackspace donated a used railway clock to us. A whole host of Arduino code is publicly available on Git Hub. Altogether as a group we can’t thank everyone enough especially James who helped answer our questions and everyone else who showed us around the space. A group of SHHM members met up to be shown around the Portland Works. It’s one of the key sites in Sheffield’s manufacturing history; among other claims to fame, it was the home of the first business to make the stainless steel cutlery that carried the city’s name into homes all over the world. It’s still used as a home for small manufacturers and artists, and the rolling refurbishment programme is doing a great job of keeping the character of the original buildings intact. Not normally open to the public, but well worth a look around if you can catch one of their open days. Gee has a nice writeup and some great photos of the site on his blog. SHHM recently played host to a group of researchers from France, interested in what the cities of tomorrow will look like. Lots of interesting discussion about the rise of hackspaces and FabLabs, and the inexorable spread and improvement of tools that make the design, prototyping, and manufacture of widgets easier for everyone. Interim conclusion: the cities of the future will look much the same, but also very different. So that’s that sorted.